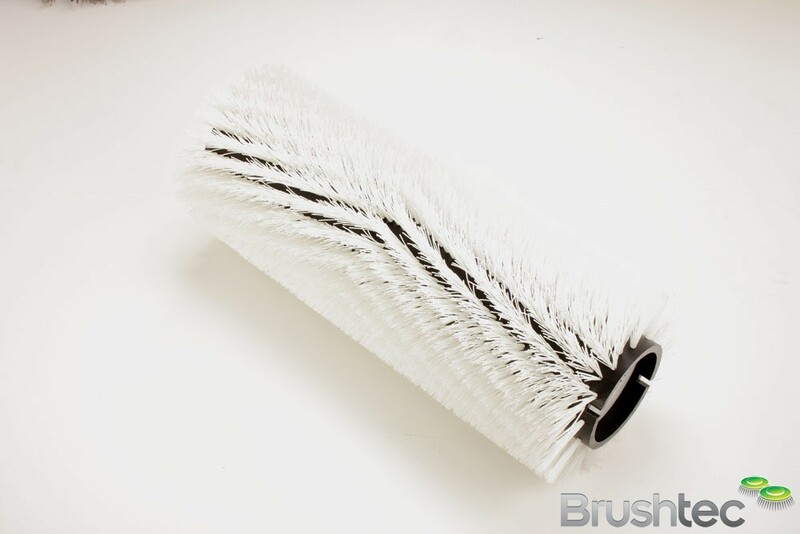 Our industrial cylinder brushes for industrial and municipal sweeping machines are constructed to the highest standard, using the best quality monofilament. 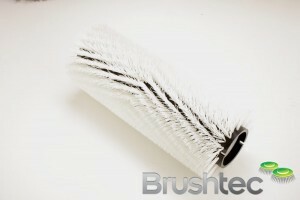 These one-piece brushes are designed for easy and fast changeover of the cylinder brush. These cylinder brooms rotate at high speeds and are made from a strong, lightweight, and balanced polymer tube. The tufted row construction incorporates space for large debris to be thrown up in to a hopper chamber by the sidewall of the tufted row, and two or three rows of tufts are normally positioned radially next to each other to support the sidewall. 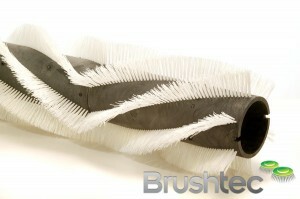 The ends of the bristles remove fine dust and loosen compacted soil from the ground through a flicking action. We only use top-quality monofilament to produce our industrial cylinder brushes so they last longer and maintain a consistent stiffness over their life. Get in touch with a member of our team if you’d like a specific bristle pattern manufacturing, such as a chevron pattern for high speed outside litter picking. 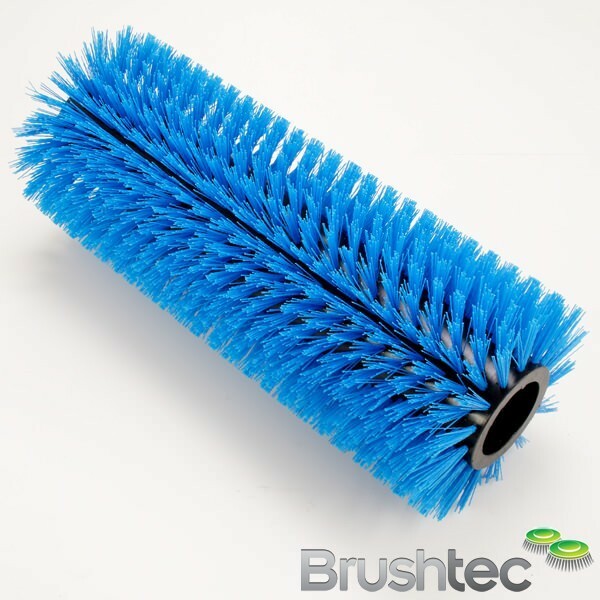 You may also be interested in our light floor cleaning and general floor scrubbing brushes, as well as our industrial polishing brushes. 24 S.R. – 24 single rows of tufts around the diameter. Often called “full fill”. Highly effective for sweeping high concentrations of dust, sand, soot and similar small-particle soilage, but not bulky litter. 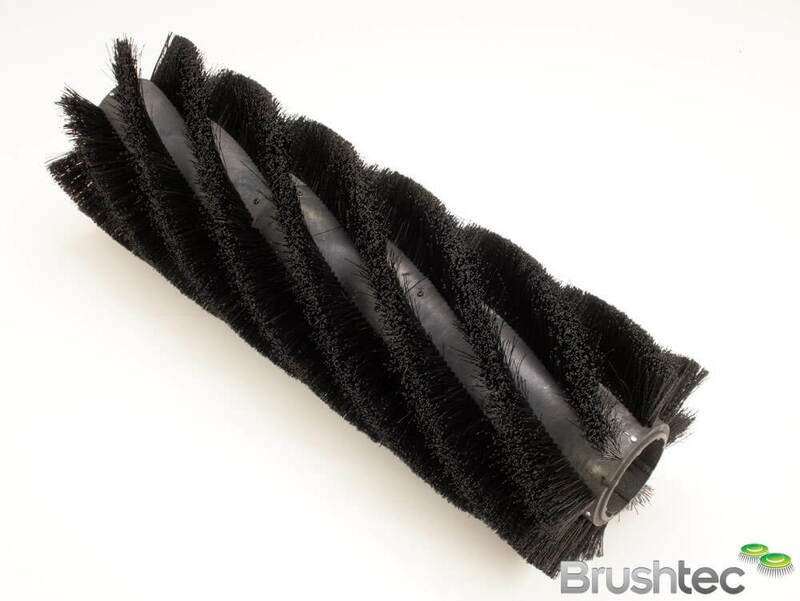 Since the brush life is not determined by the number of bristles in a brush, but by how many times it strikes the floor, a high density 24 row brush has the same life expectancy as it’s 6 or 8 row counterpart. The 6 or 8 Double Row Helical pattern (6.D.R.H. or 8.D.R.H.) 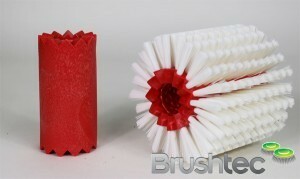 is the most popular brush fill pattern for main sweeping brushes. 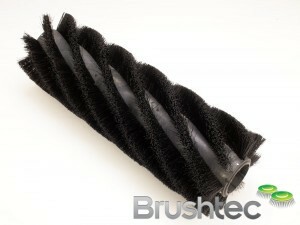 The helical design improves the pick up characteristics of the brush. A general purpose brush design that is ideal for sweeping all types of soilage. In this fill pattern, the rows of bristles pick up fine debris while the empty spaces in between the rows trap bulkier litter. The D.R. pattern is a good choice for many customers because it gives a good performance on both fine and bulky debris. This pattern is available in all fill materials. The 6 Double Row or 5 Treble Row Chevron (herringbone or patrol) pattern (6.D.R.C. or 5.T.R.C.) is the most popular brush fill pattern for outside sweeping brushes. Its ‘V’ row construction is designed specifically for directing the dirt towards the centre of the hopper for fast high-speed sweeping. This pattern has fewer rows with large empty spaces in between the rows that enable it to more effectively grab litter and trap bulkier items such as leaves. This brush is excellent for maintenance sweeping of large areas such as outside parking lots. This pattern is generally available filled in nylon to give a long life. The ‘WWW’, or ‘Sand Wedge’ is a specialized type of high density brush. It has the same amount of fill material as a regular High Density, but the pattern incorporates a zig-zagged series of “WWW” of open space, which more effectively picks up deep accumulations of fine debris. This brush is ideal for applications that have piles of sand or other fine materials. ‘Flip Flap’ or ‘ Window Brush’ is also a specialised sweeping brush. Its open “windows” trap light litter, including small scraps of paper, that are difficult to pick up with other brushes. The Window brush is particularly good on smooth floors. Cylinder Scrubs. Available up to 60” (1524mm), filled in any of the following materials: Polypropylene, Polyester, Nylon and Abrasive Nylon. Mainly used for the removal of heavy compacted soilage and rubber marks. Fill materials for cylinder brushes. Proex (X & Y shaped mixed diameter & coloured polypropylene). Excellent sweeping performance either indoors or outdoors, including environments with dampness or high humidity. The X & Y profile section of the proex increases the effective monofilament surface sweeping area by over 25%, therefore making it excellent for dust pick-up. Not recommended for very high temperature applications such as foundries. 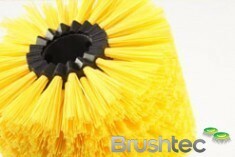 Our best selling, quality, general-purpose, ‘main broom’ sweeper brush. Good wear life. Polypropylene. Good sweeping performance either indoors or outdoors, including environments with dampness or high humidity. Not recommended for very high temperature applications. 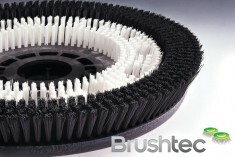 The abbreviation “poly” refers to Brush Tech’s long life, co-polymer polypropylene. Not as good as the ‘Proex’ version when picking up light dust. However, can be used in below freezing conditions. Heavy diameters are excellent at picking up large debris. Good wear life. Nylon. Nylon sweeping performance is less aggressive than poly and performs less well in conditions with moisture or high humidity. Often used on outside rough surfaces or high-temperature environments because of its toughness and excellent long wear characteristics. Can generally be used in foundries sweeping high heat debris up to 150 Celsius. Excellent wear life. Natural Fibre. Excellent sweeping material for very light dust control and sweeping fine debris, but natural fibre has a relatively shorter wear life when compared to other synthetic materials. Natural fibre must not be used on wet floors. Recommended for sweeping carpets, as natural fibre will not create static. Poor wear life. Poly & Wire. Poly gives this brush good general-purpose sweeping ability, while the wire provides a light cutting action for removing compacted dirt or mud. Good wear life. Fibre & Wire provides excellent dust control but has a poor wear life. Proex & Wire. Proex gives this brush good general-purpose sweeping ability, while the wire provides a light cutting action for impacted dirt or mud. Any main broom containing wire must not be used in either food factories or airfields. The wire fatigues before the brush wears out. Good wear life. Polyester PBT. Compared to Nylon, Polyester is stiffer with better flick action, lasts as long and performs better in damp or wet conditions, but it is more expensive. Large diameter (over 0.8mm) polyester will start to fatigue in cylinder main brooms after about 120 hours of use. On side brushes fatigue does not occur. Excellent wear life.